Marson® Rivet Ribbed Klik Nuts provide an efficient and cost-effective method of placing permanent threads in thin materials. 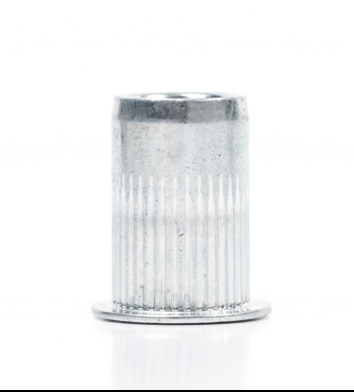 Installed from one side, these inserts are perfect for use in metal, fiberglass, and rigid plastic too thin for tapped threads. Lightweight manual and pneumatic tooling assures easy installation. Once in place, the insert's internal threads are ready for a screw or bolt. Additional features include: increased torque strength over conventional style, 60° ribbed expansion after setting, vibration resistance, and a large flanged head which increases push out strength.